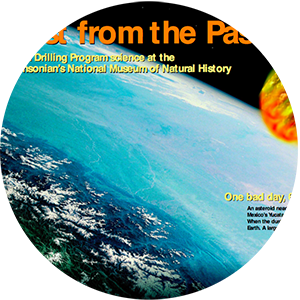 Actvity Summary: The Blast from the Past poster activities allow students to discover Earth’s history through hands-on activities and simulations. This poster’s vivid images and clear text portray the story of a large asteroid that collided with Earth sixty five million years ago at the present-day site of the Yucatan Peninsula in Mexico. This impact created the Chicxulub crater. The “blast” affected the evolution of many species and was the cause of the extinction of 50-80% of Earth’s creatures — including dinosaurs! The Ocean Drilling Program’s drilling ship, JOIDES Resolution, retrieved core during Leg 171B that contains substantial debris from this impact. A section of this important core is displayed on the poster. Through the classroom activities featured on the back of this poster, students create their own miniature crater and examine the resulting impact; compare the size of the Chicxulub crater to the size of their own communities; and study a model of the oceanic core retrieved from Leg 171B.